Crime is totally out of control in Honduras. Security has been a top concern of most of the population for many years, but gets mostly lip service or ineffective attempts at control from government (often derisively called "shows" by the public). Crime affects everyone, rich and poor, city dweller and campesino, businessmen, students, foreigners, attorneys, teachers, journalists, politicians, judges, and even children. If you are living in a city of any size in Honduras and don't know anyone who has been murdered, you are among the minority. President of Congress Juan Orlando Hernández described the current security situation in the country as "unbearable" [in English]. Former US Ambassador Hugo Llorens was quoted in the March 13 La Prensa as saying, "We are facing a tsunami of crime, that is a phenomenom that affects Central America, my country, and our families, generating fear, violence, and deaths." Crime in Honduras cannot be swept under the rug any longer. Honduras has the highest homicide rate in the world of those countries who report such things and has held various positions among the top three spots for several years. The recent United Nations Global Study on Homicide [English] put Honduras in the spotlight by naming it number one with 82.1 murders per 100,000 population. For comparison, Canada has a rate of 1.8 murders per 100,000, USA 5.0, Costa Rica 11.3, Nicaragua 13.2, Mexico 18.1, Colombia 33.4. The worldwide average is 6.9 murders per 100,000 population. Honduras' crime issues are getting coverage everywhere, including the Washington Post, CNN, Fox News, New York Times and many others. The worldwide publicity has only gotten worse. On Friday, a massacre at the San Pedro Sula airport by several individuals dressed as police and wearing ski masks (according to El Tiempo [Spanish]) resulted in six deaths and three persons injured, including some who were apparently innocent bystanders. Since the San Pedro airport is the busiest in the country and the most likely for tourists to fly into, this is likely to have a devastating affect on tourism. The UN Report is flawed, as it compares data from 2008-2009 for most countries and data as old as 2004 from one country with 2010 data from others. Some of its data are merely estimates by the World Health Organization because there is no official data available from that country or the official source of data was determined to be unreliable. For Honduras, the UN study credits the national police as their source for the 2010 homicide numbers but to determine the homicide rate per 100,000, they apparently adjusted the population estimate [Eng.] to a number they believe is more reliable. That difference results in a UN calculated rate of 82.5 per 100,000 compared to Honduras' official Observatorio de la Violencia report which shows a rate of 77.5 [Spanish]. 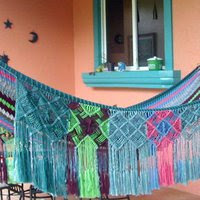 In either case, Honduras is still in the number one spot worldwide with only El Salvador even a close contender at 66.0. The Observatorio de la Violencia, which publishes the only publicly available Honduran crime statistics, relies heavily on newspaper reports to develop their detailed crime statistics. Since the major newspapers do not have a presence in most areas of the country, the newspapers tend to rely primarily upon the reports issued by the three morgues in the country (Tegucigalpa, San Pedro Sula, and La Ceiba). But because there is no nearby morgue in most of the territory, family members often object to sending the body to be examined. This is due partly to fact that many families cannot afford to pay to transport the body back home for burial, and partly due to the fact that — how do I put this for my sensitive readers? — bodies are often not returned in optimum condition due to lack of manpower, proper facilities, and refrigeration. Then there is always the general belief that "no one will do anything anyway". When there are some 20+ murders in San Pedro alone, as there was Friday, the morgue can't keep up and doesn't have enough facilities to properly store bodies. A recent El Tiempo article [Spanish] reported that 80% of violent deaths (actually 83%) in the state of Olancho were not autopsied in accordance with the law. According to DNIC (the police criminal investigation unit), 278 violent deaths occurred in Olancho between January and August of this year. Only 46 bodies from Olancho were recorded in the Tegucigalpa morgue. The article reported that one police investigator said that they have been threatened with AK-47's and threats of massacres if they tried to collect bodies for investigation. The article reports that in one instance, a contingent of 15 agents was attacked and the police official in charge was captured and decapitated. The DNIC reported 438 violent deaths in Olancho during 2010, but the official Observatorio de la Violencia statistics reported only 401, an understatement of 8%. I noticed a similar and even larger discrepancy between the La Ceiba police statistics given recently to reporters and the official statistics published by the Observatorio. All of the above reasons for the probable understating of murder statistics was discussed in a 2003 Wikileaks cable titled Truth scarier than fiction by Ambassador Larry Palmer which is summarized in this Blogicito article under the heading "Astronomical violent crime rate, endemic under-reporting". The Observatorio de la Violencia reports on other crimes as well, mostly nationally, but also giving departamento (state) statistics, and a few municipalidad (~county) and city statistics, but other crimes are so completely under-reported that the statistics are laughable at best. Because of the total breakdown of the Honduran justice system, only a small minority of crime victims ever report crimes to the police, who likely will never investigate and in many cases are suspected of being involved. There is a widespread belief that someone, somewhere along the justice process will either drop the ball or put a little or a lot of money in their own pocket in exchange for release of the suspect. There are plenty of reasons why the public does not trust the justice system. One politician said that police chiefs have told him that 40% of the police are involved in crime. Former Minister of Security Oscar Alvarez stated that at least 10 police officials are acting as air traffic controllers for narcotraffickers. Police officers have been arrested for kidnappings, bank robbery, and extortion. The Supreme Court has announced an investigation [Spanish] into certain judges regarding their rulings over narcotrafficking cases. Numerous stories are reported in which a known criminal was released 6-8-10 times allowing them to continue their life of crime for years and years. Searches in jails regularly report finding arsenals of weapons, up to and including grenades. On the same day as the airport massacre, imprisoned gang members had a shoot-out inside a jail, killing nine prisoners [Spanish]. In one of the most perplexing cases, violent criminals (serving time for murder, kidnapping, aggravated robbery, illegal weapons, etc.) were released from prison on passes [Spanish], free to commit other crimes. Prison officials say that they received cartas de libertad signed by two judges and had no choice but to release the prisoners. We only know of this case because the criminals were murdered after they left the prison. A June public opinion poll published by La Prensa included questions about crime and violence. On the left are the opinions for 2011. On the right are the opinions for the past four months. During January through June of this year [Eng. 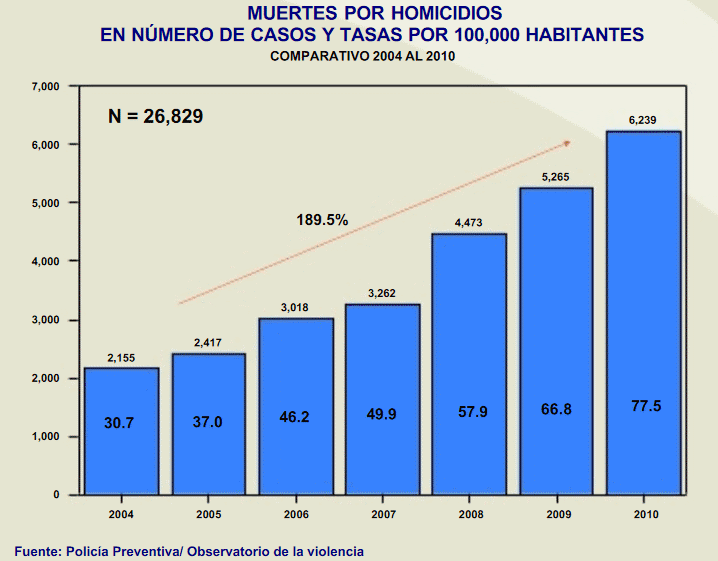 ], violent deaths in Honduras were 3,587 compared to the 2,929 deaths in the same period in 2010, a 22% increase. 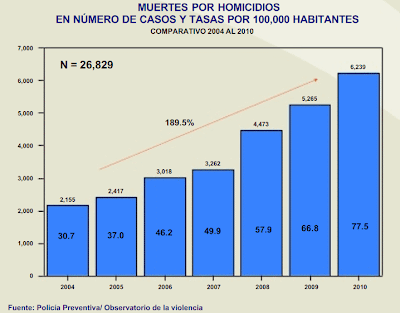 The 2011 murder rate has recently been projected to be 86 per 100,000 in Honduras [Spanish]. The government of Honduras has been trying to attract desperately needed foreign business and investment. Those in the tourism industry are trying to attract tourists. Those in real estate are trying to attract buyers. Those in NGO's, churches, and charitable groups desperately need volunteers. These are mostly going to be failing efforts until the government gets serious about doing something serious about crime and the failed justice system, which so far, they have shown little sign of doing. Crime drives away business, investment, volunteers, and tourists. Minimizing the issue of the severity of the actual crime situation or misleading tourists and investors will not help. Having been involved with the justice system on various occasions on behalf of a tourist, a Honduran, a foreign resident, and as a victim, I can tell you that it is worse than a bad joke and I know many others who have had similar bad experiences. Marco Cacerés of Honduras Weekly has hit the nail on the head with his "The airport shootings: a wake up call" article. But it would be a mistake if the government and the business community in Honduras were to try and sugarcoat and write off what occurred as nothing more than another isolated gang-related confrontation. The idea that tourists, volunteer mission groups, and business investors will continue to be comforted by such pronouncements and that their emotional tolerance is endlessly elastic is both unreasonable and naïve. The latest comments from the police [Spanish] seem to be doing just that.